Ted Dekker is a great author and I have read almost all of his books. This Outlaw series was new to me and since this is the third book I went back to read the previous book. While they don't have to be read in order, Austin is a main character in all of them. This book twists your mind, just like every other Ted Dekker book. Nyah is a hacker and very smart. She lands herself in a bad situation and seeks help from Austin. There are about three story lines going on throughout the book that all join together at the end. I really liked this book because Dekker went deeper into salvation with Christ. If you are a Ted Dekker fan you will enjoy this book! 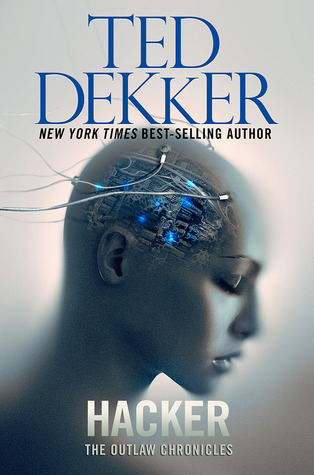 If you are new to Ted Dekker I highly recommend. Your main character in Hacker, Nyah, makes a living by cracking the firewalls of major corporations. What role does technology play in her development as a character? TD: Nyah roots a great deal of her identity in technology. In doing so she defines who she is by what she does. She even says so at the beginning of the book. I am a hacker. We all do this. For her, technology is what she knows, it’s what defines her, and provides the comfort zone. But it’s also her prison, which she comes to discover later. How does personal loss affect Nyah’s view of God? TD: When we meet Nyah, we find her in a place of great suffering especially for someone her age. That colors everything, just as it does for everyone else. For Nyah, the inescapable question is, “Why is there such suffering in the world?” Or more to the point, “Why is all of this happening to me?” That offense, that feeling of injustice and unfairness, feeds her entire view of the world, including her view of God as a distant, uncaring creator. Why do you consider Hacker a modern-day parable? TD: Parables are meant to re-frame the world differently so we can experience it again for the first time. Hacker takes a simple concept that many people already believe, that there’s another reality so near to us that we’re unaware of its presence most of the time, and puts it center stage. The story doesn’t have a moral or try to make a point per se, because that’s not what parables are for, but it does ask you to look at the world through new eyes—Nyah’s. The central question in each book in this series is, “Who am I?” What prompted you to explore that question? TD: The question of identity is central to all of life and, in fact, most of my own striving and struggle can be traced back to it. We define ourselves, almost without thinking much of it, by what we do. I’m a mother, a father, a man, a woman, a writer, an accountant… The list is neverending. But strip that all away, as death will one day for all of us, and what remains? Are you, at your core, really a mother or a father or an accountant? Or are you something far more and we’ve only bought into the notion that this costume, which we call the body and our careers and talents, is really who we are? The series so far includes a 17-year-old who claims she has been buried alive, a 13-year-old orphan with no memory, and a 17-year-old genius computer hacker. What are the similarities between these characters? TD: [Laughs.] You’ll have to read the books to find out for yourself. Ultimately, they are all forced to take a journey that begins in the valley of the shadow of death and ends on the other side of it. What role does the unseen play in your books? TD: An enormous role, because that’s how it is in real life even in a literal way. Physicists tell us that the visible universe is a miniscule slice of what actually exists, we just can’t see the rest. But just because you can’t see something doesn’t mean it’s non-existent. What makes your characters in this series “outlaws”? TD: It’s their journeys, which lead them “out of the law” of death and suffering into the light. It’s the same journey we all get to take, and which we’re called to. You grew up as a missionary kid among cannibals in Indonesia. How do you think your unusual upbringing affects your writing and your faith today? TD: My upbringing gives me a unique way of looking at the world. Understand, I grew up among people for whom spirituality was integral to life. It wasn’t tacked on or part of life… There was no separation. They believed in the unseen, they witnessed its powers, and lived as though the seen and the unseen were woven together in a beautiful, mysterious way.